Chia grass isn't just hair for ceramic heads. You can also trim it and add it to salad greens and homemade juice. 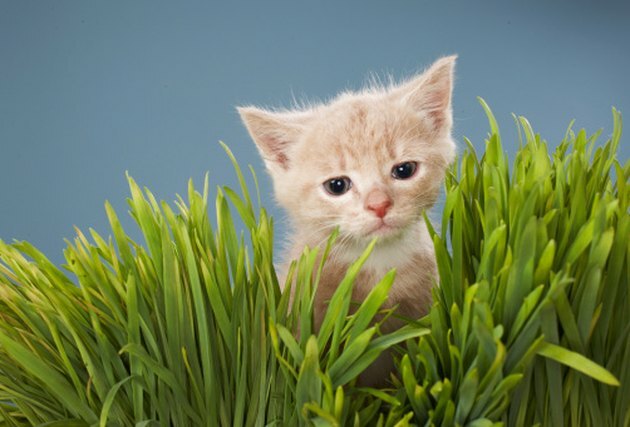 Pets can also safely nibble on this grass; cats love it for aiding digestion, while rabbits and birds can enjoy it as a weekly treat. It may also deter them from eating your good houseplants if they have a plant of their own to chew. Chia grass grows very quickly, making it a fast way to decorate your window sills. Fast sprouting also keeps kids' attention, making Chia grass a good choice for a child's first garden. Chia makes a tasty snack for felines, birds and rabbits. Place your terracotta planter on its flood tray. Fill the planter about halfway full of rich potting soil. Sprinkle a single layer of Chia seeds on top of the soil. Make sure they aren't piled on top of each other or clustered all in one spot. Sprinkle the seeds as even and level as possible. Add about another inch of soil on top of the Chia seeds. Water the soil until a little water trickles into the flood tray. Empty the flood tray immediately. Place the planter in a sunny location. The planter should get at least four hours of warm sun a day. Water every other day, keeping the soil moist to the touch. Your Chia seeds should sprout in about two days and be ready for trimming in a week. Megan Shoop has Bachelor of Arts in English literature and is proficient in both AP and MLA styles. As an editor of her college newspaper for one year, she assisted with copy editing, proofreading and layout design. She also wrote art and movie reviews and articles about campus events.